A beautiful tuxedo cat is watching a bird amid a field of daffodils. 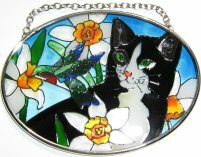 This hand painted art glass sun catcher is 4 1/4" wide x 3 1/4" high. 100% lead free, chain for hanging.